(CNN) - Indiana Gov. 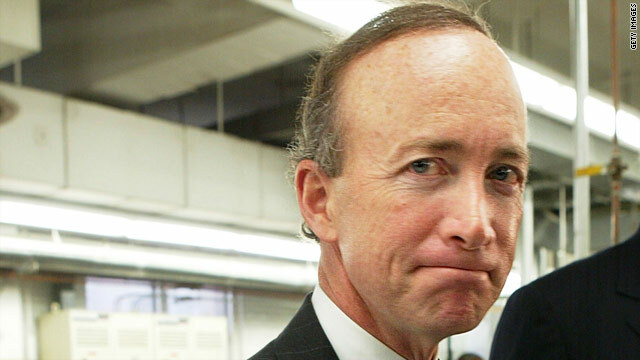 Mitch Daniels received 16 stitches to his forehead after being struck by a door after a workout Friday, his office said. After finishing a workout at an Indianapolis gym, the potential 2012 presidential candidate was standing near a door that suddenly swung open and struck him. Daniels was transported to a nearby hospital, treated, and released. The governor is currently recovering at home, his office said. His spokeswoman Jane Jankowski confirmed to CNN that the governor told her he "uttered a creative expletive" when the accident occurred. He did not provide any further details on the exact nature. At the hospital Daniels, known for his penny-pinching ways and sense of humor, asked the doctor if he was going to be charged for each of the stitches he was receiving, Jankowski said. He was assured he would not be. "He seems to be doing fine and is in good spirits," she told CNN. As of now there are no plans for him to change his schedule next week, which includes a visit to Washington for a fiscal summit and a Republican fundraisers as well as attending festivities related to the Indianapolis 500 race. - CNN's Kevin Bohn and Steve Brusk contributed to this report. Dumb. Is he gonna be the new Gerald Ford? Very bad timing... This is NOT going to help his photo ops. Nobody will vote for a guy with half his head covered in bandages. Who hit him? A Democrat? Let's start the conspiracy theories now! 1) Must be god's way of punishing this fool for taking from the poor and give to the rich. And the list goes on and on. Hey Mitch! Jesus is watching. Might wanna change your ways, your thinking, be more humble and treat everyone as your equal or as you would treat your kids and family. Just a reminder, Jesus can read your thoughts. You may say one thing in public but it is your thoughts and actions that will matter on judgement day. Does he have health insurance? Which zip code did it hit on that forehead? Not to be unkind, but you did mean 166 stitches not 16, that is one mongo forehead. Kinda reminds me of the "grays".